Throughout the film, Tevye talks to God and directly to the audience, breaking the fourth wall. In these monologues, Tevye ponders tradition, the difficulties of being poor, the Jewish community's constant fear of harassment from their non-Jewish neighbors, and important family decisions. The film was released to critical acclaim and won three Academy Awards, including Best Music, Scoring Adaptation and Original Song Score for arranger-conductor John Williams. It was nominated for several more, including Best Picture, Best Actor for Topol as Tevye, and Best Supporting Actor for Frey, who played Motel Kamzoil the Tailor. Topol and Frey had performed in stage productions of the musical; Topol as Tevye in the London production and Frey in a minor part as Mendel, the rabbi's son, on Broadway. The film's plot largely follows that of the musical from which it is adapted. In 1905, Tevye, a poor Jewish milkman living in the Ukrainian village of Anatevka, a typical shtetl in the Pale of Settlement of Imperial Russia, compares the lives of the Jews of Anatevka to a fiddler on the roof (who appears throughout the film in this metaphorical role), using tradition to "scratch out a pleasant, simple tune" without breaking their necks. In town, Tevye meets Perchik, a radical Marxist from Kiev, who admonishes them for talking but doing nothing about news of Jews being banished from their villages by the tsar. Tevye invites Perchik to stay with his family, offering him room and board in exchange for Perchik tutoring his daughters. Tevye arranges for his oldest daughter, Tzeitel, to marry Lazar Wolf, an older, and widowed, wealthy butcher. Tzeitel is in love with her childhood sweetheart, Motel Kamzoil, and begs her father not to make her marry Lazar Wolf. Although he is initially angry, Tevye realizes that Tzeitel loves Motel and yields to his daughter's demands. In order to convince his wife Golde that Tzeitel should not be married to Lazar Wolf, Tevye claims to have had a nightmare. He says that Golde's deceased grandmother told him Tzeitel is supposed to marry Motel, and that Lazar Wolf's late wife, Fruma-Sarah, threatened to kill Tzeitel if the two are married. Golde concludes that the dream was a message from their ancestors, and Tzeitel and Motel arrange to be married. At Tzeitel and Motel's wedding, an argument breaks out after Lazar Wolf presents the newlyweds with gifts. When Tevye tries to speak to Lazar about the Torah, Lazar refuses to listen, arguing that the wedding should have been his all along. Minutes later, another argument breaks out over whether a girl should be able to choose her own husband. Perchik addresses the crowd and says that, since they love each other, it should be left for the couple to decide. He creates further controversy by asking Hodel to dance with him. The crowd gradually warms to the idea and Tevye and Golde, then Motel and Tzeitel, join in dancing. The wedding proceeds with great joy. Suddenly, the military presence in the town and the constable arrive and begin a pogrom, the "demonstration" which he had earlier warned Tevye was coming. The constable stops the attack on the wedding celebration after Perchik is wounded in the scuffle with the tsar's men; however, he allows the men to continue destroying property in the village. Tevye and the immediate family stand still, until Tevye angrily orders them to clean up instead of standing around. Tevye silently asks why God allowed this to happen to them. In its original theatrical release, the film was shown with an intermission and entr'acte music. Tevye's third daughter Chava falls in love with a Russian Orthodox Christian named Fyedka. Tevye tells Chava to be distant friends with Fyedka, because of the difference in their religions. When Chava eventually works up the courage to ask Tevye's permission to marry Fyedka, Tevye tells her that marrying outside the family's faith is against tradition. He forbids her from having any contact with Fyedka or from even mentioning his name. The next morning, Fyedka and Chava elope and are married in a Russian Orthodox church. Golde learns of the marriage when she meets up with the priest. When a grief-stricken Golde tells Tevye about the marriage, he tells her that Chava is dead to the family and that they shall forget her altogether. Chava asks Tevye to accept her marriage. In a soliloquy, Tevye concludes that he cannot accept Chava marrying a non-Jew. He accuses her of abandoning the Jewish faith and disowns her. One winter day, the Jews of Anatevka are notified that they have three days to leave the village or be forced out by the government. Tevye, his family and friends begin packing up to leave, heading for various parts of Europe, Palestine, and the United States. Yente, the Matchmaker, plans to emigrate to Jerusalem, and says goodbye to Golde with an embrace before departing. Lazar Wolf plans to emigrate to Chicago, to live with his former brother in law, whom he detests, but "a relative is a relative". Lazar and Tevye share one last embrace before departing. Tevye receives letters from Hodel mentioning that she is working hard while Perchik stays in the Siberian prison. It is hoped that when Perchik is released, they will join the others in the United States. Chava and her husband Fyedka come to Tevye's house and tell the family that they are leaving for Kraków, Poland, being unable to stay in a place that would force innocent people out. Tevye shows signs of forgiving Chava by murmuring under his breath "And God be with you," silently urging Tzeitel to repeat his words to Chava. Golde calls out to Chava and Fyedka, telling them where they will be living in New York with a relative. The decision to cast Topol, instead of Zero Mostel, as Tevye was a somewhat controversial one, as the role had originated with Mostel and he had made it famous. Years later, Jewison said he felt Mostel's larger-than-life personality, while fine on stage, would cause film audiences to see him as Mostel, rather than the character of Tevye. Principal photography was done at Pinewood Studios in Buckinghamshire, England. Most of the exterior shots were done in SFR Yugoslavia—specifically in Mala Gorica, Lekenik, and Zagreb within the Yugoslav constituent republic of Croatia. Though the area was under heavy snow during location scouting in 1969, during the filming the producers had to ship in marble dust to stand in for snow. Three hundred extras conversant in various foreign languages were used, as were flocks of geese and pigs and their handlers. Isaac Stern performed the violin solos. Director Jewison has a cameo as a rabbi (voice only) during Tevye's dream sequence. The film follows the plot of the stage play very closely, retaining nearly all of the play's dialogue, although it omits the songs "Now I Have Everything" and "The Rumor (I Just Heard)". Lyrical portions of "Tevye's Dream (tailor Motel Kemzoil)" were omitted to avoid repetition. The film's soundtrack release notably contained some of these omissions, indicating they were removed during filming. These include Golde blessing herself, before going back to sleep. Changes were also made in the song "Tradition," with the film omitting the dialogue between Reb Nachum the beggar (who, in the film, cannot speak) and Lazar Wolf as well as dialogue spoken by Yente and Avram. In addition, in the film, two men argue about whether a horse claimed to be six years old was actually twelve, rather than whether the horse was actually a mule. The LP film soundtrack notably retained their names; Yitzhak and Avram, however this was also omitted the film's release. Instead, an on-set, improvised take of Topol (saying 'he sold him'), rather than the recorded dubbing, was used. The Constable gets orders from his superior for a "demonstration" against the Jews (referred to by the superior as "Christ-killers") in Anatevka. Perchik is arrested at a workers' rally in Kiev. Golde goes to the priest to look for Chava (described by her in the stage production). She is confronted there with Christian images (of historically Jewish individuals) in a juxtaposition with the synagogue montage at the start of the film. Motel gets dressed for his upcoming wedding to Tzeitel. The rabbi and his students inside the synagogue receive news of the arrival of Motel's new sewing machine. The rabbi takes the Torah out of the ark inside the synagogue for the last time. He weeps and chants quietly about having to abandon the synagogue. Tevye feeds his animals in the barn for the final time. He tells his lame horse to take care of his leg and to treat his new owner and master well. The scene with Hodel and Perchik, where he plans to leave to start a revolution, was extended in the film. A new song sung by Perchik was recorded ("Any Day Now"), but was omitted from the final print; however, it was included in the 2004 reissue of the soundtrack. When the film was re-released to theaters in 1979, 32 minutes were cut, including the songs "Far from the Home I Love" and "Anatevka". In the film, Tevye and Lazar Wolf discuss Wolf's proposed marriage to Tzeitel in Wolf's home, while in the stage version, the two meet in a tavern. The film shows Wolf's home as filled with golden artifacts. Prior to Lazar Wolf entering the scene, Tevye speaks to a female servant, who tells him not to touch anything. Although a faithful adaptation of the original stage version, Fiddler scholar Jan Lisa Huttner has noted several differences between stage and screen. She argues that changes in American culture and politics and developments in Israel led the filmmakers to portray certain characters differently and to offer a different version of Anatevka. For example, the Broadway production cast Bea Arthur as a tall, booming Yente, while the film portrays Yente as tiny and timid. Huttner also notes that the "Chagall color palette" of the original Broadway production was exchanged for a grittier, more realistic depiction of the village of Anatevka. Because the film follows the stage musical so closely, and the musical did not have an overture, the filmmakers chose to eliminate the customary film overture played before the beginning of most motion pictures shown in a roadshow-style presentation. However, there is a solo by the Fiddler played over the opening credits (after the conclusion of "Tradition"), there is an intermission featuring entr'acte music, and exit music is played at the end after the closing credits. The film was a success, earning United Artists profits of $6.1 million, plus distribution profits of $8 million. On review aggregator website Rotten Tomatoes, the film holds an 83% rating based on 40 reviews, with an average of 7.7/10. The consensus summarizes: "A bird may love a fish -- and musical fans will love this adaptation of Fiddler on the Roof, even if it isn't quite as transcendent as the long-running stage version." Roger Ebert thought the story line of the musical was "quite simply boring" but still gave the screen version three stars out of four, explaining that director Norman Jewison "has made as good a film as can be made" from the material. Gene Siskel awarded three-and-a-half stars out of four, writing that the musical numbers were "better staged and choreographed than in any recent Broadway film adaptation." Vincent Canby of The New York Times thought the film version was inferior, explaining that by "literalizing" the show with real landscapes and houses, Jewison and Stein "have effectively overwhelmed not only Aleichem, but the best things about the stage production ... pushed beyond its limits, the music goes flat and renders banal moments that, on the stage, are immensely moving." Charles Champlin of the Los Angeles Times wrote that the film "has been done not only with such artistry but also with such evident love, devotion, integrity and high aspiration that watching it is a kind of duplex pleasure." Gary Arnold of The Washington Post stated, "Jewison's 'Fiddler' is a great film, by which I mean great in the sense that matters most—greatly moving, an extraordinarily powerful, emotional experience." Pauline Kael of The New Yorker called it "an absolutely smashing movie; it is not especially sensitive, it is far from delicate, and it isn't even particularly imaginative, but it seems to me the most powerful movie musical ever made." ^ "Fiddler on the Roof (U)". British Board of Film Classification. August 19, 1971. Retrieved April 21, 2013. ^ Movie Box Office Figures. LDS Film. Retrieved April 15, 2013. ^ a b "Fiddler on the Roof (1971)". AFI Catalog of Feature Films. Retrieved April 29, 2018. ^ Walker, Craig (2011). On The Buses: The Complete Story. Andrews UK Limited. ISBN 978-1908382849. ^ a b Isenberg 2014, p. ix. ^ Isenberg 2014, pp. ix, 124. ^ "My Kinda Town". Second Avenue Tzivi. September 11, 2014. ^ Tino Balio, United Artists: The Company That Changed the Film Industry, University of Wisconsin Press, 1987, p. 194. ^ "Fiddler on the Roof (1971)". Rotten Tomatoes. Flixster. Retrieved November 29, 2016. ^ Ebert, Roger. "Fiddler on the Roof". RogerEbert.com. Retrieved December 5, 2018. ^ Siskel, Gene (November 12, 1971). "Wide-screen 'Fiddler': the gamble pays off". Chicago Tribune. Section 2, p. 13. ^ Canby, Vincent (November 28, 1971). 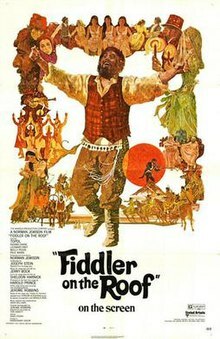 "Is 'Fiddler' More DeMille Than Sholem Aleichem?". The New York Times. 36. ^ Champlin, Charles (November 5, 1971). "'Fiddler on Roof' a Labor of Love". Los Angeles Times. Part IV, p. 1. ^ Arnold, Gary (November 11, 1971). "Fiddler: 'Big, Beautiful Surprise". The Washington Post. C1. ^ Kael, Pauline (November 13, 1971). "The Current Cinema". The New Yorker p. 133. ^ "AFI's 100 Years... 100 Movies" (PDF). Retrieved January 29, 2018. ^ "AFI's Greatest Movie Musicals" (PDF). Retrieved January 29, 2018. Isenberg, Barbara (2014). Tradition! : The Highly Improbable, Ultimately Triumphant Broadway-to-Hollywood Story of Fiddler on the Roof, the World's Most Beloved Musical. St. Martin's Press. p. ix. ISBN 1466862521.